5S is a system for organizing space to perform work effectively and efficiently it can be applied at home or at office or in an organization. When we go in the history of 5S , it began in Toyota motor company in 20th century as a part of lean manufacturing along with many other tools like kaizen, kanban, jidoka, poka yoke etc. This is also called foundation of Toyota Production System. It started in Japan in Toyota but now accepted world wide by many company and organization . But the questions is, can we implement 5S at our home ? My answer is Yes why not , the main advantage of this system is that we can apply it at our home with no or less cost. But for that we need to understand the concept of 5S. 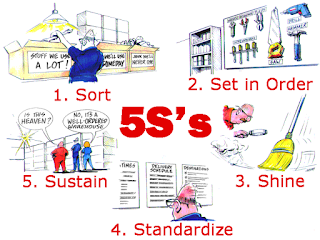 The 5S methodology is a systematic approach to workplace/ organization. 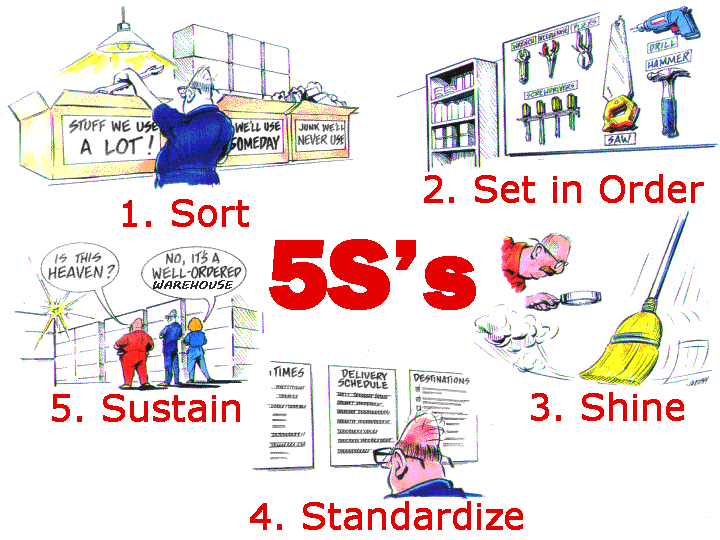 This method includes the five steps of Sort, Set in Order, Shine, Standardize, and Sustain. Five S are 5 Japanese word used to describe the steps of the 5S system. Each term starts with an S. In Japanese, the five S's are Seiri, Seiton, Seiso, Seiketsu, and Shitsuke. In English, the five S's are translated as Sort, Set in Order, Shine, Standardize, and Sustain. Seiso Shine keep workplace areas clean. This means cleaning and maintaining the newly organized work space. It can involve routine tasks such as mopping, dusting, etc. or performing maintenance on machinery, tools, and other equipment. Seiketsu Standardize Create a set of standards for both organization and processes. In essence, this is where you take the first three S's and make rules for how and when these tasks will be performed. These standards can involve schedules, charts, lists, etc. How it can be implemented? 2.If it is needed, is it needed in this quantity? 3.If it is needed, how frequently is it used? 4.If it is needed, should it be located here? 1.Make sure that all unnecessary items are eliminated from the workplace. 2.Taking into account of the work flow, decide which things to put where. 3.Use Why-why to decide where each item belongs. 4. Create a maintenance system for housekeeping. Make a schedule for cleaning of the workplace. 2. Dedication, commitment, devotion and sincerity are needed in implementation of 5S on daily basis. 3. Inspections of first three S’s should be done and the results displayed regularly. 4.Everyone must make it a part of their daily work. with the help of these simple steps we ca implement 5 S in our organization or at workplace it can also be implemented at home also with the same steps it will help us to manage our daily work of help us to manage our kitchen items. or simply we can say we didn't need to waste time on find key on daily biases.